I used to think of it as the strange stuff I’d see in strange gas stations on my strange cross country road trips. It was usually in stick form, a long tubular stick, wrapped in a coating of plastic, with a peculiar name like… Slim Jim, not because it made you slim, but because it was a slim, tubular portion…in a coating of plastic. But then, I made my own. It was not slim, it was not tubular, and there was no plastic. No, there was just meat and slow dry heat, and a few seasonings of my choosing. One of the simplest ways of preserving meat is by drying it. It is also one of the simplest. 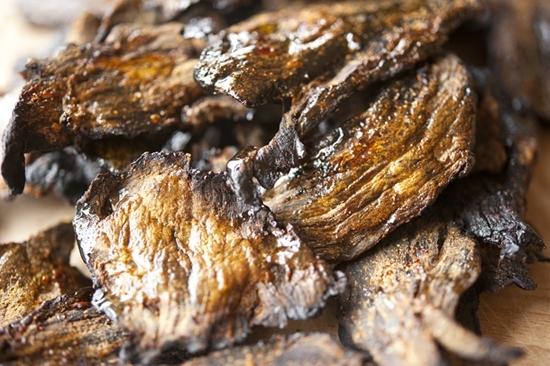 Fresh strips of meat are often first soaked in a marinade or brine, then traditionally, hung to dry in the sun, the attic or other dry place. Some people let it hang over a slow, smoky fire, which adds flavor and discourages flies. You can, of course be modern, and use the oven or a dehydrator. This recipe works for so many meats, the most popular are venison or elk… I’ve seen it used for pheasant too. Also try: other antlered game, pheasant, and bison. Put the meat in the freezer for about 30 minutes, just until firm. Once chilled, slice into strips across the grain - about ¼ inch thick. Mix the other ingredients together in a bowl and stir to combine. Let sit for 10 minutes to macerate. Add the strips to the marinade, cover and let sit in the refrigerator overnight. The next day, preheat the oven to 200 degrees F.
Place the strips on a baking sheet lined with foil and place in the oven. With the oven door propped open, let the strips dry until they are pliable, 5-7 hours. Store in a plastic container for up to 2 weeks. My daddy would SO LOVE this! Can’t wait to share it with him! Thanks love! I looooooove Jerky. Thanks! Also, mr-mrs-jerky.com is a great place to purchase the choicest of jerky if you don’t feel like making it. They are a nice old couple that travel around to various large events and set up their little table. (That was before the good camera, sorry). Hummm, Like the addition of wine vinegar. On thing I do know though, jerky is a great way to use smoked salt. In South Africa (where I live in Cape Town), Biltong and droewors are a way of life! They are part of our tradition and all South Africans eat them on a regular basis. 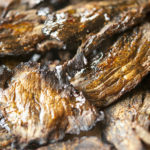 Biltong is like your jerky however looks a bit more moist and usually has some fat through it. Droewors literally translates to “dried sausage” and is my ultimate. Flavoured with coriander (cilantro) seed, salt and pepper and studded with meat and fat pieces like a good sausage should be. Interesting that you make your own – I must say it is a novelty to see a woman making it as it is normally the ‘mans’ work here in South Africa. Thanks for showing us how simple it is to make jerky. Funny how something so odd looking is really one of life’s greatest snack foods. Who needs pretty cupcakes when you have jerky? Hi Ashley, thanks for stopping by and nice to “meet” you. For storing jerky I recommend letting it completely cool before putting it in an airtight container with some paper towel. For longer term storage, I would recommend vacuum sealed bags, which you can even store in the freezer. I think you can get a vacuum sealer rather affordably these days. Shrink wrap is another option. Enjoy the elk jerky! Good recipe but I might add in one extra thing, some good smoked salt. Seasonings are a little different than what I use, but will try in the next batch I make. 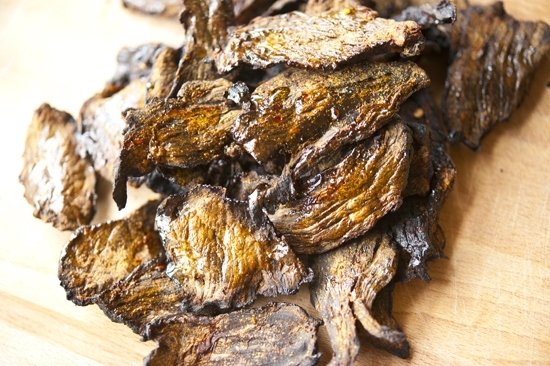 I use a dehydrator and to give the jerky a little smoke flavor I add a small amount of liquid smoke to the marinate. I have seen reference to smoked salt in posts below. I’m not familar with it. Woud in accomplish the same thing as the liquid smoke? I also like to make fish jerky. The marinade for that is pineapple juice and soy sause. Love the fish jerky idea. I sell salmon jerky in my Open Sky store. I think the liquid smoke would have a stronger flavor than the smoked salt! im looking for a good wildturkey jerkey recipe. always harvest a spring bird and interested in any special recipies?? thanks james from Detroit Michigan. You can use this same recipe for turkey meat as well!